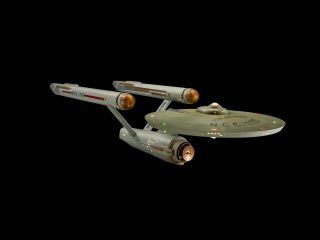 The original USS Enterprise starship model used in "Star Trek" is seen restored in the Smithsonian Channel's "Building Star Trek" documentary airing Sept. 4, 2016 to mark the TV series' 50th anniversary. Watching the show is a lot of fun as it shows off how the staff of two museums were trying to restore props to their former glory, for the public to enjoy the show all over again. It's appropriate given that "Star Trek" is celebrating its 50th anniversary this year. But there also were some fun tidbits in the documentary that are worth sharing – here are five of them. Remember Beatlemania? Turns out there was Spockmania as well. Shortly after the show aired, the world's most famous half-Vulcan (portrayed by Leonard Nimoy) received reams of fan mail from girls who were in love with the logically minded alien. Observers in the documentary point out that it's a bit of an enigma, given that Spock is supposed to be devoid of most human emotions; although his mother was human, he undertook training to suppress his human side. Some teenagers, however, really like to go after the Vulcan. If you'd like to learn more about their passionate feelings, there's an entire collection at UCLA of his fan mail, including letters begging him never to change his stoic personality. It seems an illogical thing to say if you want someone to respond to your love, but who can speak for the human heart? In one of the saddest moments in "Star Trek" production history, the set was mostly thrown into a dumpster after the show ended. You have to remember that in the 1960s, the show was just another series that ended after three seasons. It was only in reruns that the show became immensely popular, finally sparking a spin-off movie in 1979 and the arrival of a new "Star Trek" crew in 1987. While the dumpster story is sad, there is a small consolation. It turns out that some of the pieces of the Enterprise were dismantled and then re-used for film student projects for at least a few years. Because the dismantling wasn't closely tracked, it's also possible there are pieces lying around the same warehouse that could be used today. So at least parts of the set truly lived on in a next generation. William Shatner and Nichelle Nichols embrace as Kirk and Uhura in a scene from the classic "Star Trek" episode Plato's Stepchildren. While it's been known for years that Nichelle Nichols (who played the black communications officer, Uhura) saw one of TV's first interracial kisses as no big deal, she reveals a lesser-known reason in the documentary. When Uhura and the white Captain James T. Kirk (played by William Shatner) locked lips in "Plato's Stepchildren," America was in the middle of a civil rights revolution. Blacks were demanding better access to jobs, public facilities and many other things after decades of segregation. Interracial couples were often frowned upon. Nichols, however, always saw her groundbreaking moment as nothing more than another kiss. One reason, she added, is that it reminded her of her grandfather and grandmother, who were white and black. One of the delightful things the documentary shows – repeatedly – is grown adults reacting with glee when it comes to looking at "Star Trek" memorabilia. Brooks Peck, a curator at Seattle's EMP Museum, is charged with collecting props for a new "Star Trek" exhibit. But it seems like some of the time, Peck is fighting the same tempation as any fan. Peck, who appears to always travel with gloves if there's a chance he'll handle any artifact, admits to being very tempted to sit in Kirk's captain's chair when it arrives at his exhibit. But he adds he'll never give in – it's his responsibility to be caretaker of this history. Near the documentary's end, the folks at Google Translate give us a small delight. They hold up signs in Russian spelling out favourite "Star Trek" phrases (the "5-year mission" sorts of tropes) and in just microseconds, a cell phone camera renders the signs into English. The process is not perfect – there's a hilarious oral misrendering of a translation near the end of the segment – but it's very impressive so far. Our only regret: Klingon is not shown. Online sources say Klingon is not offered (at least yet) in Google Translate as of early 2016. But competitor Bing does translate Klingon. On a related note: is it too much to ask that after Google includes Klingon, it could add Dothraki? Some of us Trekkies are Game of Thrones fans, too. "Building Star Trek" airs Sunday, Sept. 4, at 8 p.m. ET/PT on the Smithsonian Channel. To learn more about the program, visit the "Building Star Trek" website here .